Buying farmland is never an easy task. From the site selection to staying within government regulations to simply managing your property’s taxes and finances, buying farmland is a tedious task with a lot of ins-and-outs. 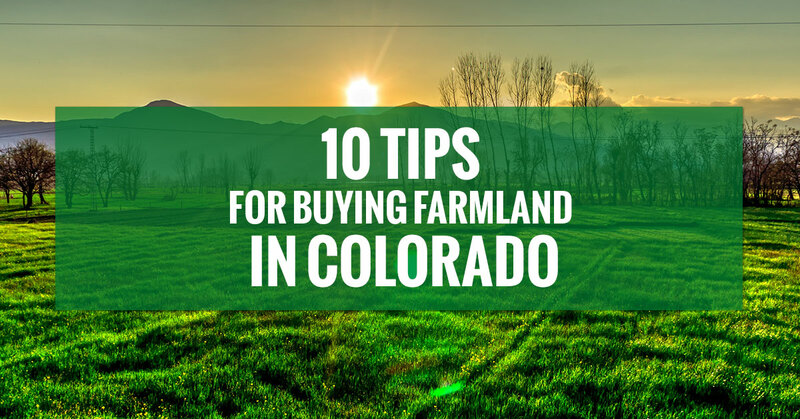 But whether you’re in the market for a plot of land in Colorado to use for crops, livestock, or other, there are several tips you should first consider before buying your Colorado farmland. Before you even go about searching for an area of land in Colorado that suits your needs, you must first have a full grasp of your financial situation. How much can you/your business afford to spend? How will you go about financing your land? What other expenditures will you have? What are the conditions of the area? All of these questions and more can factor into the overall cost of your land, so make sure you have a full estimate for all of your expenses. Before you’re fully sold on a location, it’s important that you know the land and the surrounding area’s climate. In Colorado, we often experience all four seasons – and the extremes that are brought on by them. Spring produces rain (and sometimes hail, a disaster for crops and livestock), summers have heat and thunderstorms, fall has decreasing temperatures with an occasional frost, and our winters are cold, bitter, and white. You need to take into account what you’ll be using your farmland for and how the seasons will affect your returns and day-to-day operations. If you’re going to be growing crops, or even managing livestock or cattle, you need to know the full story behind your land’s soil. What is it good for, how does it react, and how will it positively or negatively impact your revenue? Getting a full soil profile can make or break your purchase, so be sure to have one requested. This importance of your Colorado farmland’s water cannot be overstated. Different areas of the state have different water rights, so it’s important to know what exactly you’re getting into with regards to where your water comes from and how you can use it. Whether your farmland has irrigation capabilities, wells, or other sources, water is a major key towards understanding your land’s value. In addition to the climate of the area, you need to understand the farmland’s environment and any potential problems associated with it. A common environmental hazard is erosion, so be sure you know the area and the land well before you encounter any costly cleanups. Getting an on-site environmental audit can save you money in the long run. Before you embark on your expansion plans for your farmland, you need to understand the zoning of your acreage. Check for things like zoning restrictions or conservation easements, which may have a significant impact on your farmland’s valuation, and check to see if your land falls under assured leases through the Bureau of Land Management, U.S. Forest Service, or other agency. Sort out with your partner, spouse, family, or company how you will own the deed. Will it be you as an individual, or jointly? Will it be in a corporation (LLC or LLP)? How you own the land, and the benefits or disadvantages associated, can affect the long-term plans and goals of your agricultural development. If you’re planning on constructing additional facilities, barns, or other structures on your farmland, you of course need to know the costs associated, the zoning guidelines, and also the structural engineering aspect of your plans. Get individual blueprints drawn up for not only the layout of your farmland, but any additional structures you will be adding. If you need help, you can always get it from the professionals at AGPRO. Agricultural development in Colorado, including buying farmland, requires a certain level of governmental and environmental compliance. You need to be able to manage your daily operations in a way that is efficient, effective, and safe. AGPROfessionals, for instance, offers our On-Point Advantage System to help with your agriculture project compliance. The On-Point Advantage System is a satellite-driven monitoring system that is cost-effective and monitors, stores, and reports on-site environmental compliance information from anywhere in the world. It’s secure, internet-based, and good for testing water levels, rainfall, wind speed/direction, flow, temperature (air or soil), voltage/amperage, and more. Contact us to find out more! We saved the best for last, obviously. If you’re in the market for agricultural development real estate in Greeley or elsewhere in Colorado, contact the developers that you can trust. Here at AGPRO, we specialize in agricultural development, and can help you with all of the tips above and more. We believe there is more to the agriculture real estate business than just selling farms and ranches. We understand that it’s an investment for you and your family, which is why we go above and beyond to maximize your return on investment and provide you with convenience, service, and an understanding that is unparallelled in the area. We take great pride in serving the agricultural community and finding you the right fit for your needs, whether you’re searching for a dairy or feedlot facility, pork and poultry facility, relocation, subdividing land, site selection, or more. Not only are we the agricultural development experts in Colorado, but our in-house brokers are also licensed in Kansas, Montana, Nebraska, New Mexico, Nevada, South Dakota, and Wyoming. Contact AGPROfessionals today to get started on living your agricultural dreams.